This ceramic holiday decoration will remind you of inserted all the bulbs and arranging the colors on the one your grandmother used to have! Every grandmother had one of these at Christmas back in the day, and now you can have one too to remind you of Christmas as a kid! This Nostalgic Ceramic Christmas Tree from Miles Kimball goes perfectly on any mantel, counter, bookshelf, or anywhere that can be reached with a six foot long power cord. Place on the counter in your guest bathroom for a cozy holiday atmosphere for guests, or even on your bedside table. The possibilities for this nostalgic Christmas decoration are endless! 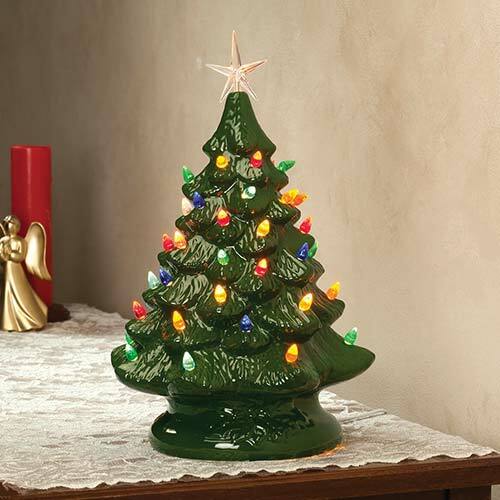 With multi-colored lights on a green base, this ceramic Christmas tree goes with any holiday decor and color scheme. Order one for you and one for your mother or grandmother to remind them of Christmases from years past! This is also a great option for someone living in a dorm room, assisted living, nursing home, or even for a teacher’s classroom! If someone on your list can’t have a normal, realistic sized Christmas tree, get them this ceramic tabletop version instead. Made for indoor environments, this tree brings a cozy glow to any room, and warms everyone with the great nostalgic memories of childhood holidays. Order your Nostalgic Ceramic Christmas Tree from Miles Kimball today!